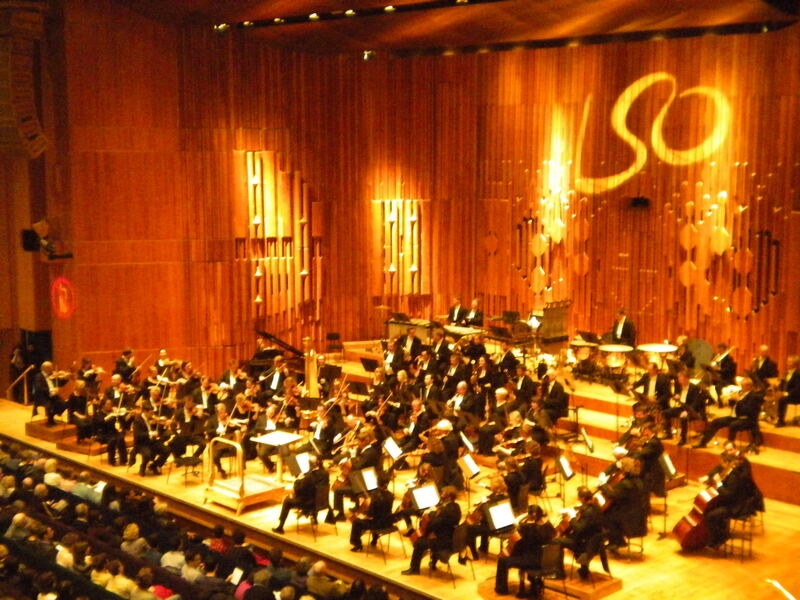 Seeing the London Symphony Orchestra in a robust concert program of Beethoven at the Hall at Barbican Centre is one of the many great things you might come across here in London. In fact, seeing the LSO perform at all in their resident hall is one of the must-sees, despite the many offerings around town. The Barbican Centre is in itself a destination site, serving as a vast multidisciplinary arts center. In addition to the orchestra, the Centre books genre-crossing events that appeal to wide-ranging and divergent demographics. The Sapphires, a Motown-inspired female trio played an engagement a few nights before, while jazz veteran, Kurt Elling played the very next night after the LSO. Add to that a versatile art space exhibiting videogame images of bowling by Cory Arcangel, an elite underground-level art house cinema and a swanky gourmet cafeteria illuminated by a functional array of light jars. Beethoven’s crowd-pleasing Symphony No. 7 was the centerpiece in a Sunday night concert I attended, along with his Piano Concerto No. 7 and a newly commissioned piece by 25-year-old composer Vlad Maistorovici. Being conducted by Sir Colin Davis, the familiar Symphony No. 7 was what classical music aficionados clearly wanted to hear. Just as the symphony completed its final note, the audience response was instantly rapturous with the applause. It was a given, though. The orchestra provided full music-making in absolutely precise motion among the players during the grand-standing segments. For the quieter moments, Sir Davis directed his ensemble to play at a careful pace, more so to make the audience aware of the delicate acoustics of this fine hall. Jonathan Biss played a pleasant Piano Concerto No. 3, which the orchestra supported in tandem with flowing proficiency. Biss performed this same concerto in a previous concert I saw with the Boston Symphony at Tanglewood. He displayed the expert techniques and accomplished pianissimos here as he did at the Tanglewood Festival. The British audiences, London in particular, are different in expressing their reactions for a performance. What I noticed is that they tend to applaud loudly and longingly if they feel the performance was deserving, but they do not stand for an ovation as New Yorkers are apt to do on any given night on Broadway. Formal as they are, reserved perhaps, the Brits are not quite as generous as Americans are during a night at the theatre. This is fine anyway, because not every performance requires a standing ovation.